Many of these feelings have seemed to become a constant for these young immigrants after U.S. Attorney General Jeff Sessions announced the Trump administration’s decision to rescind the Deferred Action for Childhood Arrivals program, or DACA, earlier this month. Concerns about not being able to finish school, losing their jobs and not being able to pay their mortgages came to mind. When applying for DACA, applicants were required to provide their current and previous addresses and underwent biographic and biometric background checks. This was in addition to meeting other requirements such as being under the age of 31 in 2012, arriving in the U.S. before age 16, being in school, having a GED or high school certification or having served in the military, and having no criminal record. For Yolanda Medina, a DACA recipient, there’s no reason why ICE should consider DREAMers a threat to public safety. “We do get fingerprinted. They background check us. I’m not afraid, if someone asks me ‘You’re a DREAMer, they have your documentation.’ Yeah, but I have a good moral character. Why should I be afraid? I haven’t done anything wrong,” she said. According to a recently released report by the Cato Institute, DREAMers are less likely than those born in the United States of the same age and education level to be incarcerated. The study found the incarceration rate for those born on U.S. soil was 14 percent higher than DREAMers’ rate. Because undocumented immigrants who have a criminal record couldn’t apply for DACA, the policy research think tank defined DREAMers as those undocumented immigrants who met all the requirements for DACA, except the criminal record condition. Some local immigration attorneys have differing views about the possibility of agencies sharing this kind of information. Attorney Joshua De La Ossa said only DACA recipients with particular cases should pay more attention to how their information might be used. “I wouldn’t want to panic DACA recipients to think that ICE is going to come looking for them,” De La Ossa said. “The ones who (could be) concerned about this issue are DACA recipients that have prior orders of removal or have been caught trying to cross the border multiple times,” he said. When DACA was implemented, young immigrants could apply only if they hadn’t left the country since 2007. De La Ossa said cases of DACA recipients who were deported or got caught crossing the border before 2007 could have been admitted. This scenario could have created cases of DACA recipients who have a history of orders of deportation or stops at the border, he said. Meanwhile, attorney Paul Djurisic said he thinks the line that separates the United States Citizenship and Immigration Services from ICE is more thin. 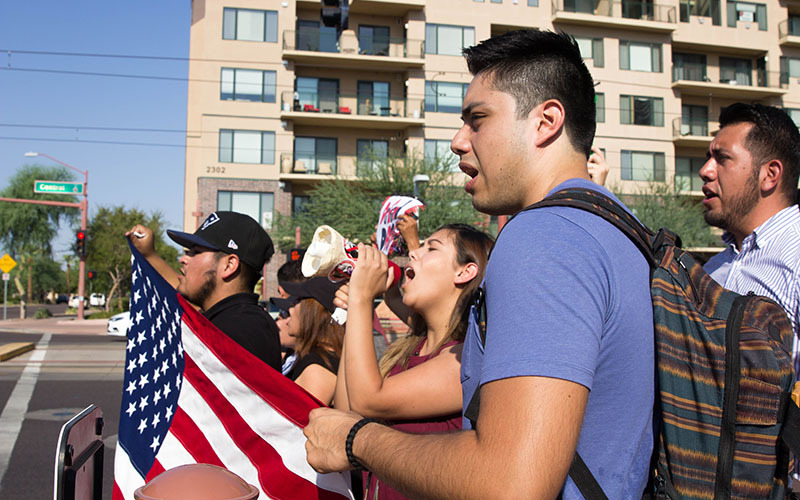 When asked by Cronkite News, representatives in Phoenix’s ICE field office referred to the information found on the DHS website. No further comment was provided. However, attorneys said DACA recipients should be more careful. They said with the current administration, immigration enforcement has been tougher. Djurisic said he is currently working on a case in which a DACA recipient was taken into ICE custody after being arrested for a standard DUI. The difference is, the attorney said, the person hadn’t been convicted yet and was still taken to the immigration detention center in Eloy. He said this type of measure is new. De La Ossa said he has seen this pattern, too. “Right after Trump took office, anyone getting into ICE custody is not released as easily as they used to be. And we’re talking about people who are undocumented and (are) stopped for traffic infractions, and being taken into ICE custody,” De La Ossa said. Medina said ever since she and her friends got DACA, they’ve always known they have to be more cautious. However, she said she does feel this administration has been more challenging in terms of how immigration cases are handled. “That’s what I tell my friends. ‘If you drink, don’t drive. Don’t be speeding, you can be a target.’ That is a reality that all of us face,” she said. Djurisic also said he’s concerned the Trump administration might be tougher with DACA renewals too. He said there’s already been many delays in immigration applications as a whole. “Across the board there’s been an increase in delays in all the applications, not just DACA but pretty much everything. So I think there is higher scrutiny on all applications,” Djurisic said. “I wouldn’t doubt that you’re going to find a higher percentage of denials between now and Oct. 5. Those cases that are being renewed now will be looked at extremely closely,” he said. But Medina and other DREAMers said they don’t want this political climate to cause fear. “We have rights. We shouldn’t be afraid. We have to get informed about our rights so we can inform others in the community,” Medina said.